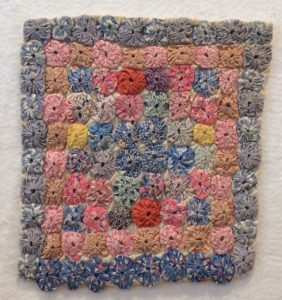 This adorable little Yo-Yo quilt is made of 1” Yo-Yos which are mostly from fabrics made in the 1930s. It is so little and so precious. Each one is stitched to the one next to it as well as to a muslin base and the entire quilt is only 9.5” x 11”. I found it on E-bay (as I did all the quilts I will be showing today) and I think it is a wonderful little treasure. The next one is 15.5” x 24.5”. 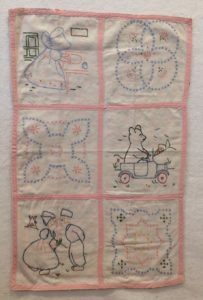 It reminds me of the many tea towels from the same era, and it includes embroidery work as well as piecing. 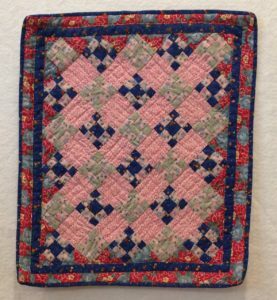 There is no batting but it is has been quilted together in the pink bias tape strips. I can’t help but wonder if it wasn’t made for a special little child as a doll quilt to cover her little dolly for bed time. 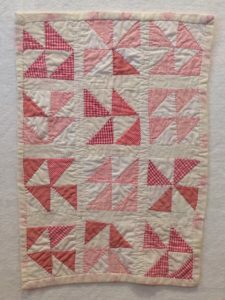 Look at this charming pink/red and white “Pinwheel” quilt. I use the word pinwheel loosely because when you look at it you can see that only a few of the blocks turned out to have that shape. Others look like “Broken Dishes” and some are simply four triangles put together. I can just imagine that grandma was helping her little granddaughter make her first quilt. After the blocks came together in wonky ways she didn’t have the heart to make her take them apart and make them all alike. That only adds to the character of this little quilt and endears it to me. I choose to believe that this next quilt was made by an older adult for a child. The 9 patches are all perfectly made and set on point nicely. There are also two borders around it and the color placements are all symmetrical making it look wonderful. I know this last one isn’t beautiful but it is so representative of the 1930s with the bubble gum pink borders. 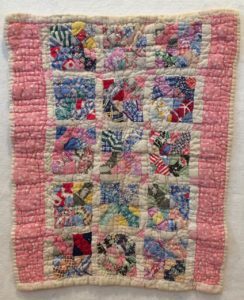 It is hard to tell in the photo, because the quilter didn’t use much contrast in her blocks, but each block is made up of four bow tie blocks put together. It makes me imagine that she was using up scraps and the batting is quite thick which leads me to believe it may have been made of a section of an old worn out blanket. It reminds me of the old saying “Waste not, want not”. ← Row by Row Shop Winner is Liz K. of Englewood!! !